SSG Bumpus, served with the U.S. Army 1996-2005. He served in Iraq during Operation Iraq Freedom. Matt died, at age 31, August 2008, from complications of AML. His case with the V.A. has been denied. 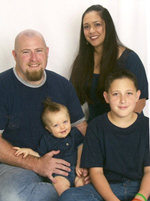 Matt left behind his beloved wife and sons, as well as many other family and friends. Nilton Cacoilo served as a Helicopter Mechanic and Hazardous Materials Handler during his time of service. Nilton served two tours in Iraq. On November 4, 2009, he was diagnosed with AML. Nilton died March 2010, at age 24, due to complications of AML and Acute Cutis. At the time of his death Nilton left behind his parents, as well as many other beloved family members and friends. Served in Iraq in multiple deployments throughout Gulf War. Jaime died, at age 41, January 2009, from complications of AML. At the time of his death Jamie left behind his wife and children, as well as many other beloved family members and friends. SSGT Nienajadlo was medivac'd out of Balad, Iraq on July 29, 2008 with AML. She died March 20, 2009. Danielle worked and lived close to the burn pits. She got sick fast. Danielle left behind her husband and three sons, as well as many other beloved family members and friends. Steven died, at age 32, in July 2008 from complications of AML. At the time of his death Steven left behind his wife and daughter, as well as many other beloved family members and friends. Service connection to the AML has been denied. Visit Steven's Page. He served In Iraq during the Gulf War Operation Iraq Freedom. Andy died, at age 22, October 2007, from complications of AML. Andy's case with the V.A. has been denied. Please take a moment to become a fan on Facebook! We try to keep fairly active with our social media. Your voice really can make a difference. Please visit our Call to Action Page and tell us how you feel about this situation. Write a letter to your local representatives and ask them to support legistlation that is making a difference, particularly in regards to current VA CFR rules and medical research. Help us spread the word. Share this and related sites with your friends, please!